This building stood on the corner of the green by Priest Lane. Today you would be standing outside the current library to take this shot but the building itself is long gone. There are two cottages, one having a shop front, and a large shared inglenook fireplace in the middle. 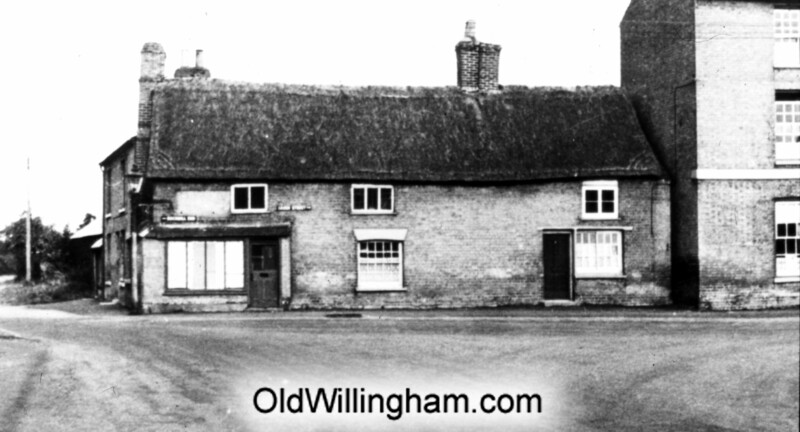 This picture was probably taken about 1930 but after World War II the owner, Mr. Sutherland, plastered over the brickwork and painted it all white except for black fake timber beams, moulded into the plaster so as to look like a Tudor style building. He also covered the upper windows and painted three large scenes of sailing galleons at sea with sails billowing in the wind. As one long time village resident commented “this was one of the most memorable house fronts in the village”.